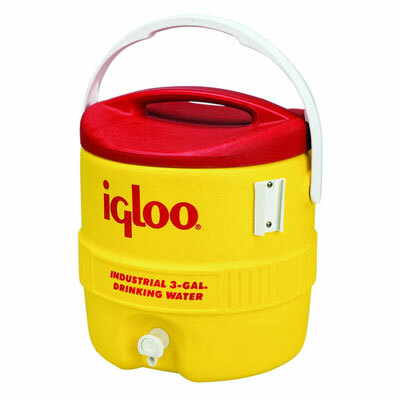 Having the best cold retention in the water cooler industry, this Igloo cooler keeps water cold longer and is ideal for hydrating a small work crew on the jobsite or in the shop. • Cooler maintains ice for 3 days at 90°F! Wipe interior and exterior surfaces clean before storing and between uses. To prevent stains and odors, empty cooler of contents after use. Light dirt or stains can be cleaned with water or mild detergent. Tougher stains may be cleaned with diluted solution of baking soda and water. Ensure all cleaning agents are thoroughly rinsed and the cooler is dry before storage. If cooler has a pour spout, store it with spout open to allow moisture to escape. For set-in stains or odors, use gloves to wipe inside of cooler with bleach, rinse and let dry thoroughly.